SHOW ME THE MONEY!!! 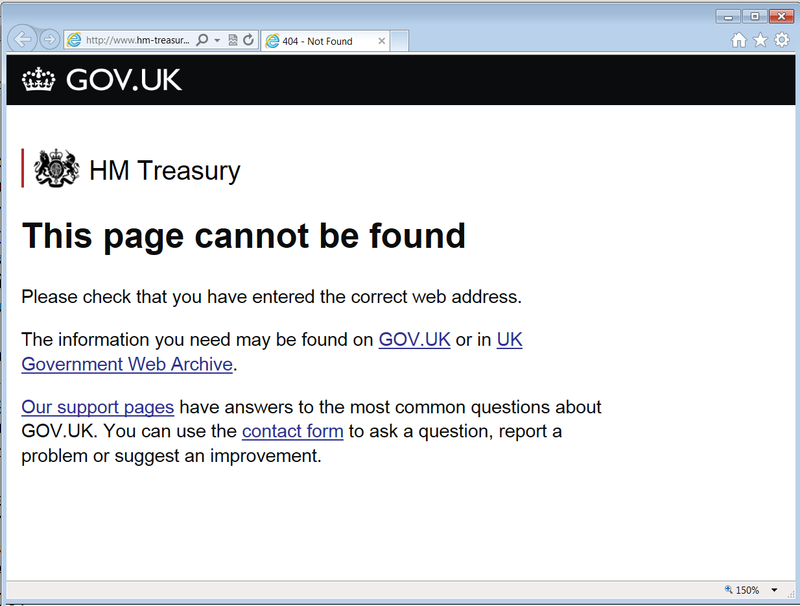 Bank of England Bullion-How Much & Who Owns It? Did Bank of England ‘misplace’ 1300 Tons of Gold, or do they have MORE than they report?? 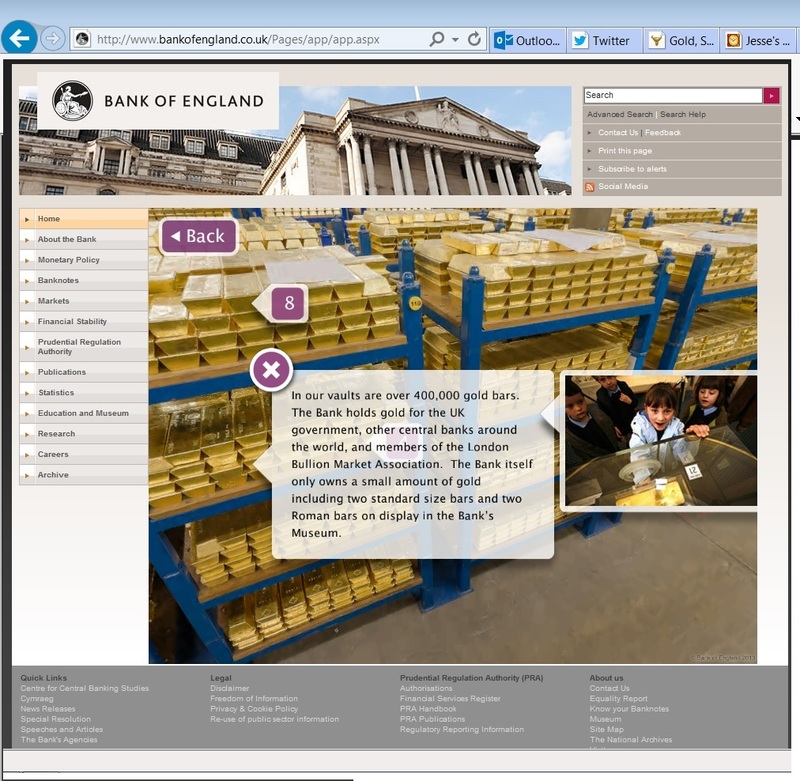 BOE states on their current website that it has on hand “over 400,000 bars [of 400 oz] in their vaults”. According to Alasdair MacLeod of GoldMoney.com, on the @KeiserReport last week, the last Annual Report of the Bank of England indicated that there was over 505,000 bars in the vault. [Note: Interview Starts at 13:00; this discussion begins at 18:00] Since April 2013, it seems that there is a marked inability to deliver Gold bullion to its rightful owners, by the US Federal Reserve and ABN Amro Bank (Netherlands) and increasingly, maybe others. 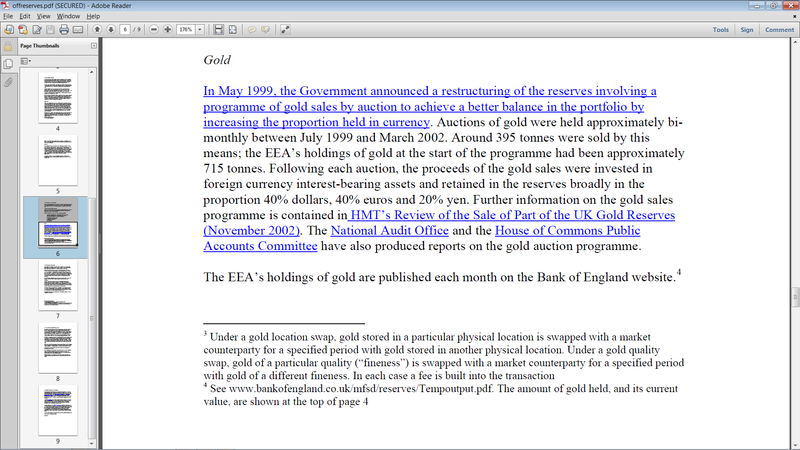 One wonders if BOE made a typographical error, and thus inadvertently told the TRUTH about their reserves, and/or has BOE also been involved in the “GOLDEN SHUFFLE” that has so impacted the paper gold prices?? What will it take to UNWIND the musical chair shenanigans perpetrated by the bullion banks? In attempting to navigate through BOE’s CURRENT website, I was able to find MacLeod’s reference to the amount of gold stored. A screenshot is provided here. Unfortunately, navigating through BOE’s obscure Annual Report, it becomes obvious that publicly revealing the level of Gold Reserves under BOE management is NOT something BOE desires. While it repeatedly states that those statistics are available, repeated following of various links PURPORTING to give that information either are DEAD LINKS, or contain the PREAMBLE and OUTLINE of the reports but NOT the DATA. In other words, the Index to the information is there, just no information! Below is another screenshot retrieved after laborious circular link-following, which explains that BOE’s assets can be swapped by location and by quality with other “market counterparties”, but not much else. It does give the original figure of 715 tonnes in 1999 and quotes a figure of “around 395 tonnes” sold up through 2002. Excellent… if one is tracking data by decade (except for the LAST decade). The balance sheet shows L10,570 Million of Gold as of March 31, 2013 [immediately before the takedown in the paper gold market]. On that date, spot gold was L1039 per ounce, indicating a quantity of 10,173,244 ounces, very close to the estimate of 320 tonnes left over from the sales of 1999-2002. 400 oz x 105,000 bars = 42 million oz. So that means BOE has / had either 202 Million oz or 160 Million oz, OF WHICH , only 10.28 Million Oz actually BELONG to BOE/UK. Ergo, EITHER 149.7 Million ounces OR 191.7 Million Ounces are being held for others. That’s a lot of gold to be able to play with in the markets. Who owns it? How many of those ounces / bars /tonnes have been leased out, hypothecated, re-hypothecated, or SOLD? And how many needed to be liquidated into the paper markets to bring down the price from $1900 to $1170 these past few months? Is the BOE the source of all the Gold going to China and India? IF MR. MacLEOD’S THEORY IS CORRECT, THE COST OF MANIPULATING A MARKET IS ABOUT $29.4 BILLION DOLLARS. (42M oz @ $1900 minus 42M oz @ $1200). A little more transparency and regulation would go a long way to explaining the aberrant market behavior since April… something the FED, BOE, IMF, CFTC might want to work on. ALL of the statistics listed include the (…) notation!! 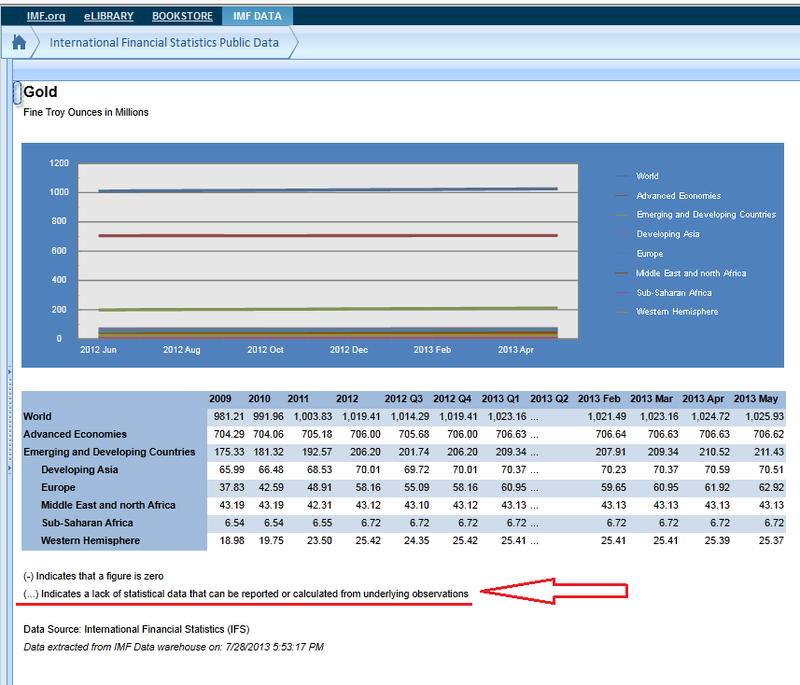 In other words, this official IMF chart is total BS. The mainstream media sheep continue to spout that Gold is a free market? They are either incompetent, or bought and paid for by one of the 147 TNC’s that CONTROL the world’s financial markets. This is the largest fraud in history, and the world population who will be bankrupted by these practices will not be content to eat Twinkies while the bankers plunder the national treasuries.